Osteoarthritis may occur following an accident. Such as when the ankle breaks or is sprained several times. Cartilage damage may occur at the same time as the ankle injury, but could also occur later as a result of damage to the ankle. The latter is called ‘post-traumatic osteoarthritis’. It is the result of the ankle being less stable after the injury. The cartilage wears more quickly due to the unstable movements. Post-traumatic osteoarthritis may sometimes only cause problems years after the injury occurred. Inflammation of the joint can affect the cartilage, such as in rheumatoid arthritis (rheumatism). This also causes the layer of cartilage to thin, or disappear completely. It could occur at any age. Both ankles/feet are usually affected and osteoarthritis is often discovered in other joints in the body as well. The cartilage layer in the joint sometimes wears down without any apparent cause. Wear and tear results in the layer of cartilage at the end of the bone thinning and in the end the underlying bone may be (partially) exposed. Rough protrusions (osteophytes or parrot beaks) may occur on the bone. They may be felt and visible. Fluid may build up in and around the joint causing swelling. The pain and the swelling make movement difficult and painful. This form of osteoarthritis is most common among the elderly and is often hereditary. 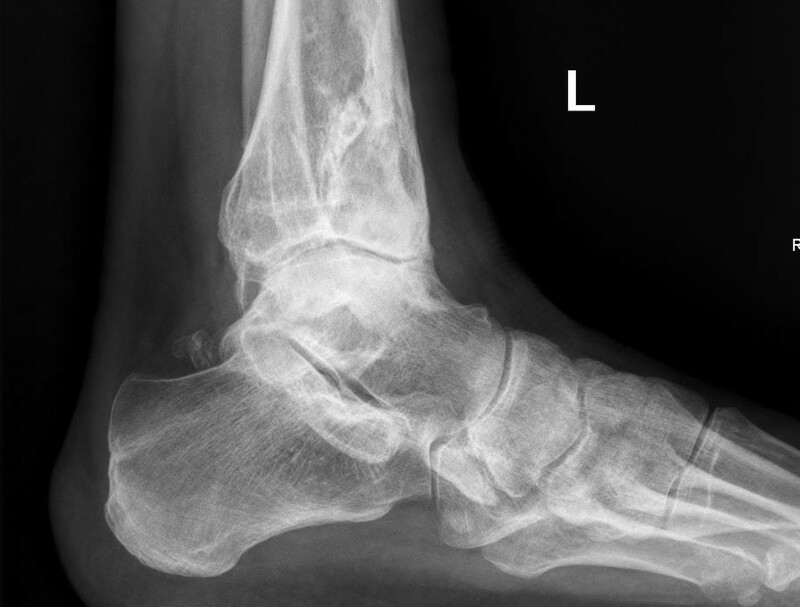 The best way to establish osteoarthritis of the ankle is through an X-ray of the ankle. The ankle joint (articulatio talocruralis or upper hinge joint) is found near the articulatio talocalcaneonavicularis or lower hinge joint (the joint between the heel bone and the talus or ankle bone). Osteoarthritis may also occur in the lower hinge joint and this can cause pain in the ankle too. An X-ray usually reveals whether wear and tear is present in one or both joints. In some cases it may be necessary to perform a scan to obtain more certainty regarding the diagnosis. There are surgical and non-surgical treatments for osteoarthritis of the ankle. Initially non-surgical treatment is tried to alleviate the complaints. 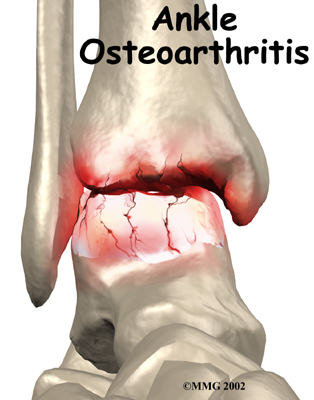 There are several types of treatment available for osteoarthritis. The type, severity and extent of the osteoarthritis will determine the most effective treatment for you. 1. Damage to the joint cartilage or surrounding soft tissue: The ankle joint is covered in joint cartilage. Cartilage is smooth and its function is to ensure supple movement of the joints. A localised cartilage injury may occur following an ankle injury such as a sprained ankle. The period between the time of the injury and the manifestation of any complaints is sometimes long, over a year is not uncommon. The ankle is painful, feels unstable and may swell up. In some cases the ankle may become blocked, and feels as though it is impossible to move. We refer to this as a joint mouse (a loose fragment of cartilage) in the joint. 2. Impingement (pinching of the ankle due to bone growth or thickened mucous membrane): The ankle may be pinched (also called an impingement) at the front or back. This causes pain when the foot is moved upwards or downwards. The ankle’s movement becomes limited and the capsule at the front or back of the ankle is pinched. If the ankle is pinched at the front it is also called ‘footballer’s ankle’ and may occur if the ankle is frequently sprained. The surgeon inserts the camera and other instruments in the joint through two or three small stitch-size incisions. 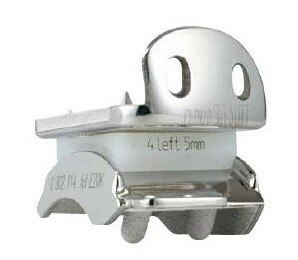 The specialist is able to operate in the joint using all kinds of small pliers and a type of vacuum cleaner (shaver). The ankle may be operated on via the front or back, depending where the problem is. The joint is ‘cleaned up’ during keyhole surgery. This is a relatively minor procedure usually performed at the outpatient clinic. The surgeon removes damaged cartilage and bone protrusions in and around the joint using small pliers and shavers (type of small vacuum cleaners). This operation is useful during the early stage of osteoarthritis. If the operation is a success the complaints are reduced but do not usually disappear completely. It may take several months before the maximum effect is achieved. You can usually put weight on the operated ankle immediately after the operation. In some cases it may be necessary to keep the weight off the ankle for several weeks and you will need to use crutches to walk. Most patients (75-80%) are satisfied with the end result of this operation. Unfortunately, there is also a risk that in approximately 5% of patients this operation will make the complaints worse. With osteoarthritis of the ankle cleaning up the joint is useful in the early stages of osteoarthritis. Arthrodesis involves securing the bones of a joint together. 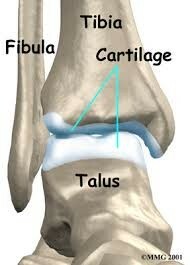 In the ankle this means that the tibia is secured to the talus. As a result the ankle is immobilised. Immobilisation of the ankle is generally a relatively successful operation. Although you are no longer able to use the joint as normal because it cannot bend, the pain is significantly reduced or disappears completely. This makes moving around easier. When the joint is immobilised the remaining cartilage in the joint is removed. This is usually done using keyhole surgery. 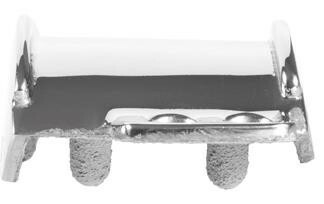 The ends of the bone are positioned together in the right position and secured with screws below the skin. If the joint below the ankle also displays osteoarthritis, a large metal rod can sometimes be inserted through the heel, which holds both the ankle and the lower hinge joint in place, and is called a double fusion. After the operation: A cast is needed after the operation. Several weeks later it is usually possible to transfer to a walking boot. On average bone requires ten weeks to fuse together properly, but there are exceptions when it may take a lot longer. Mobility of the foot: Following a successful operation in which the ankle is immobilised, patients can function relatively normally. The greatest disadvantage of this operation is that the ankle can no longer move. This makes it difficult for the foot to roll properly or stand on tiptoe. There is still movement in the joints of the mid-foot, so it appears that the ankle can still move a little. Few people need adjusted shoes following this operation. Walking barefoot may prove more difficult than when wearing shoes (people with a stiff ankle will limp slightly when walking barefoot). Most people are able to simply resume their previous work after this operation. Most will be somewhat limited in their sporting activities such as running and jumping. In general, sports such as swimming, golf and cycling can be practised normally. With an ankle replacement the worn joint is replaced by a prosthesis. In the procedure a limited amount of bone is removed from the ankle and instead a metal cover is inserted with a type of hard plastic component in between. No bone cement is used to fix the two metal components in place. At the rear they are covered in hydroxyapatite, which promotes the ingrowth of bone, as a result of which the prosthesis, as it were, grows into the original bone. The components of the prosthesis are available in different sizes to resemble your original joint as closely as possible. The plastic component comes in different thicknesses to achieve the perfect ligament balance; the new ankle joint must not be too loose, nor too stiff. After the operation: You can usually return home a few days later. A standard cast is fitted after the procedure. In principle, when you are discharged this cast is replaced by a walking boot, which means you can already put weight on the operated leg. The ankle may be painful for the first few days after the procedure. You will be given the necessary pain therapy to control it. The pain will gradually decrease. During the first few weeks it is recommended that you regularly elevate the leg, as it tends to swell if weight is put on it for long periods, causing increasing pain. During the first few weeks it is important to regularly place ice on the ankle to prevent the foot swelling. During cast immobilisation anti-thrombotic prophylaxis is administered (phlebitis injections). This consists of daily injections to prevent phlebitis or clot formation and embolism. The stitches are usually removed during your consultation a couple of weeks later. You can try wearing normal (roomy) shoes, if possible, around four weeks later. However, in some cases there will still be some swelling, which will gradually subside. Therefore, it is better to avoid wearing tight-fitting shoes at first. It is important to train the mobility of the toes. In principle you can start right away in your cast. Once the wound is healed and the cast has been removed we advise you to exercise the mobility of the toes and ankle in water using alternating baths (alternating between cold and hot water). This helps the joints become supple again more quickly and the swelling will go down faster. Nevertheless, you must bear in mind that swelling of the foot and ankle is not abnormal the first few months. It is also recommended that you have physiotherapy. The physiotherapist can administer additional lymph drainage and make the corrected joint mobile more quickly. A normal gait can also be relearned. The scar will gradually fade over time. Once the cast has been removed you may hydrate the foot and massage the scar by applying a foot cream or moisturiser. This will make the skin supple and benefit the scar’s appearance. It is also best to keep your scar out of direct sunlight during the first year. The aim of an ankle prosthesis is for your ankle to be painless, stable and movable. You should not expect normal movement (as with a normal ankle). However, the movement you have will be more than adequate for your everyday life. Sports activities such as swimming and cycling are permitted. Walking is also allowed. However, running sports are not recommended. Driving is usually possible again after six to eight weeks. The expected lifespan of a prosthesis: studies have revealed that after 15 years, 90% of prostheses are still in good condition. Yet much depends on the patient’s activities. If the prosthesis becomes detached there are techniques to potentially replace it. The following non-exhaustive list of complications may occur after surgery. - Swelling of the ankle: very common and will usually persist for between two and four months. The swelling usually increases during the course of the day. - Infected wound: as in any surgical procedure, the wound may become infected, despite the measures taken. This can usually be treated with the right antibiotics. - Deep vein thrombosis, phlebitis and pulmonary embolism: this complication may still occur in spite of anti-coagulants being prescribed. It involves a clot forming in the veins that can sometimes be transported to the lungs (embolism). It requires hospitalisation for declotting therapy that usually has to be continued at home in the form of medication. - Loss of feeling: because the skin nerves cross some of the areas where incisions are made, this may result in a direct injury or as a result of wound retraction (nerve contusion). This causes a temporary or, in rare cases, permanent loss of feeling in part of the foot. - RSD: this is an unexpected disruption of the localised blood supply with initial pronounced swelling, feeling hot to the touch, tingling, perspiring, clamminess and a shine to the skin, as well as localised osteoporosis. If these signs appear, you must contact your doctor urgently, as fast treatment usually provides a favourable prognosis. - Loosening or bone ingrowth failure: despite the best fixation techniques, in some cases the bone has insufficient healing capacity. As a result the bone does not fuse with the prosthesis. A second procedure may be necessary. - Risks associated with the anaesthetic: these are best discussed with your anaesthetist.